Two Su-25 attack aircraft of the Armed Forces of Ukraine have been shot down near the village of Dmytrivka of Donetsk region by surface-to-air missile systems, with the pilots bailing out, the anti-terrorist operation (ATO) press center reported. 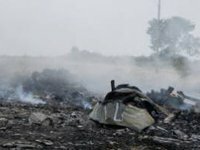 "Today near the village of Dmytrivka, when units of the Armed Forces of Ukraine that were bravely defending the border of our state received fire support, the terrorists shot down two Ukrainian Su-25 attack aircraft," reads a report from the press center posted on the page in Facebook on Wednesday. The ATO press center said that after the tasks in this area have been fulfilled by four fighters of the aviation of the land troops, "pro-Russian military units fired at them with surface-to-air missile systems." "Despite performing anti-missile maneuvers, two planes were damaged. The pilots bailed out," the report said. Donetsk-based separatists claim they shot down two Ukrainian attack aircraft near the town of Snizhne. "The pilot of one of the attack aircraft ejected near Snizhne. The search for him is underway. Yet another (Sukhoi) Su-25 aircraft has reportedly been damaged and gone towards the north," the Donetsk militia headquarters of the self-proclaimed Donetsk People's Republic (DPR) told Interfax on Wednesday. Press officer of the anti-terrorist operation (ATO) headquarters Oleksiy Dmytrashkivsky confirmed this information to Interfax-Ukraine. " "We have information about downed fighter planes. The circumstances of what happened are currently being clarified," he said on Wednesday. The Defense Ministry of Ukraine reported that according to initial reports the two pilots bailed out. "However, they probably landed on the territory controlled by the illegal armed units," a source at the ministry told the agency.